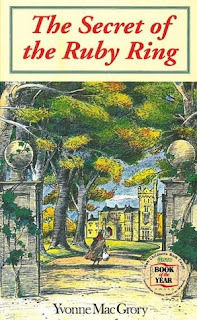 The Secret of the Ruby Ring, by Yvonne MacGrory (1994) is not a bad book. 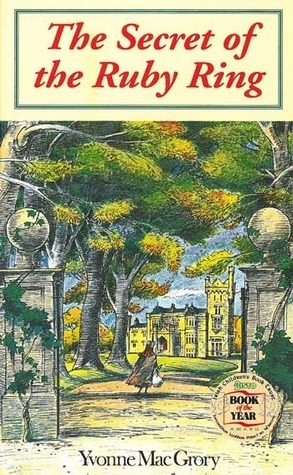 If I had read it when I was 9 or so, I might have loved it. As an adult, though, I found it boring both the first time I read it ten years ago and when reading it again the last few days. It's the story of an Irish girl named Lucy who wishes on a magic ring that she could live in a bigger house. Lucy is a spoiled brat of a 12 year old who's not happy with her comfy life and always wants to win and know all the answers at school, so not very appealing. The ring grants her wish...by taking her back in time to a 19th century grand Irish country home, where she is a servant. Lucy and the reader learn a lot about historic cooking and cleaning and gardening and clothes etc. (lots and lots of descriptions) and we also all learn about Irish politics of the time and the hardships the Irish people suffered at the hands of the English landowners. We learn lots, unleavened by much in the way of interesting story. Some tension is provided by Lucy's loss of her magic ring, and her efforts to find it, but it wasn't all that much tension. Lucy just doesn't seem to me to have any character to speak of. And though Roger and Elizabeth, the two English children of the house, are almost in tears when she leaves, it beats me why they would care all that much because there wasn't much to speak of that bonded them beyond a teensy bit of ring-recovering adventure, and one brief "Elizabeth and Lucy talk as though they are equals" scene, which was abrupt enough that it just felt awkward to me and not narratively meaningful. I think that 10 or 11 year old fans of Downton Abbey might like it because of the upstairs/downstairs set up of the story, and the historical details might be more interesting if they are already predisposed to care about them. And inveterate time travel readers that age might also find it satisfying because the premise is wonderfully magical. Though actually it's not very interesting time travel--no language issues, almost no slip ups in which Lucy betrays knowledge of the future, easy slipping into a routine of hard and unfamiliar work. The adult reader (aka me) might be unconvinced that Lucy's ignorance is overlooked as much as it is.